Strategically located about 60 miles east of Los Angeles, San Bernardino was colonized in 1851 as an expansion outpost for the Mormon Church. Today, it is the county seat for the largest county in the United States. Captured here in over 200 vintage photographs is the history of this Southern California city and its role in the state's development for more than two centuries. Many famous, as well as infamous, faces have passed through the area, contributing to the rich history of the region, including Kit Carson, Wyatt Earp, President Lyndon Johnson, and early explorer Jedediah Smith. 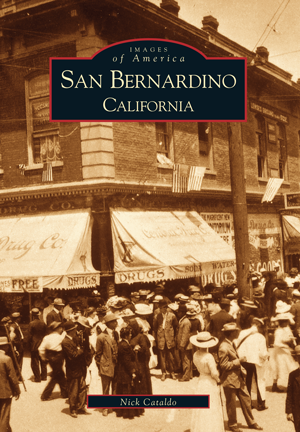 Featuring images from the San Bernardino Historical Society, this book brings readers back in time to the city's earliest development, from early Native American settlements, through the Mission period, the Mexican Rancho era, the arrival of Mormon families, the impact of the railroads, and up to the challenges of the 20th century. Author Nick Cataldo is past president of the San Bernardino Historical and Pioneer Society, and is currently serving on its Board of Directors. He is also on the publications committee for the San Bernardino County Museum Association.